The Internet of Things (IoT) is connecting “things” together. NDT systems have important data that can be shared and used to improve product quality and plant productivity. While NDT lags when it comes to connecting to the shop floor, the NDT process can definitively be integrated. 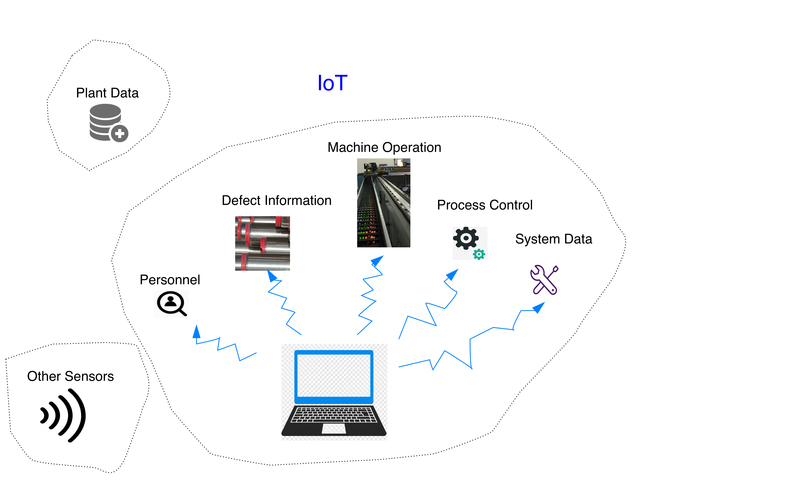 By loading a real-time IoT stream, NDT personnel and quality managers can conduct analyses to pull more value from that data as plants gradually move from reactive to proactive operations. This comprehensive approach goes beyond merely ingesting data to perform analytics on the real time data stream. When defects appear or trends are showing managers can react by fixing the process prior to NDT and can also study the event data to foresee and prevent similar events from happening in the future. Data is available in real time. On-site connections are done via a local intranet, creating an Industrial Intranet of Things. Offsite connections are typically made through the Internet, often via a cloud-based storage system. Cloud technology is ideal for IoT due to its inherent flexibility, low relative cost, and scalability all of which are important as IoT projects gain momentum. In addition, a complete solution should allow managers to take action when an event requires a specific response based on predefined rules. A large amount of information can be extracted from the NDT software. This is the first step. In addition, process information can be extracted from other company software or procedures. Other sensors may be used as required: vibration, position, temperature, vision sensors or others as adapted to the monitoring requirements. IoT allows quality managers to be on top of their operation in real time. NDT, being a critical component of the overall production process, may be used not only as a quality check but has a way to provide information to operation managers about the efficiency of their manufacturing processes. It provides a data stream for a comprehensive view of the company performance allowing to report on parts, defects and work flow.